The state-owned ski area at Mount Sunapee State Park recently took another significant turn. Commissioner Sarah Stewart of the Department of Natural and Cultural Resources (DNCR) consented to a lease transfer request that allows industry giant Vail Resorts to take over the lease and operations of the Mount Sunapee ski area. Proposed lease amendments accompanied the announcement and will go to the Governor and the Executive Council this month. The commissioner delivered the decision at a public meeting at the park on September 26. View the meeting and lease amendment discussion via Newport Community TV Online. Extend to Vail Resorts the 2016 lease amendment that enables resort development of the West Bowl. The Cardigan Highlanders Volunteer Trail Crew (CHVTC) will be on Mount Sunapee this weekend and welcomes help with the trail work at hand. On Saturday, October 6, the trail crew will meet at Mount Sunapee State Park, ride the chairlift to the top of the mountain, and then descend the Summit Trail to work on drainage dips. “We hope and expect to stop when we reach the fixtures we built in our earlier five days of work there this season, then hike downhill to our cars and refreshments,” said crew leader Craig Sanborn. The Summit Trail is a popular public hiking trail on Mount Sunapee. This job is necessary for the health of the trail, explained Sanborn. Other trail work will continue on Sunday or Monday on the Newbury Trail. On Friday, the trail crew will be on Mount Kearsarge, the Rollins Trail. The gear needed: leather boots, long pants, and BYO work gloves or gloves will be provided. Food, water, and supplies for all day in the forecasted weather, dry and 50s. For more information or to volunteer, contact Craig Sanborn, email: crgsnbrn@yahoo.com. The Cardigan Highlanders is a non-profit organization recruiting new trail workers and support. It has been doing trail work on Mount Sunapee and Mount Cardigan since 1985. See the Cardigan Highlanders website. Sarah Stewart will be the next commissioner of the New Hampshire Department of Natural and Cultural Resources. The agency oversees the divisions of Parks & Recreation, Forests & Lands, Historical Resources, Film & Digital Media, Libraries, and N.H. State Council on the Arts. After a public hearing April 6 on the nomination, the Executive Council confirmed Stewart on April 11 in a unanimous vote. Stewart will replace Jeff Rose, who held the position after the re-organization of the Department and Resources and Economic Development (DRED) in 2017. Staring in 2014, before the agency breakup, Rose served as the commissioner of DRED. Representatives of Friends of Mount Sunapee (FOMS) attended both (April 6 and 11) council meetings on the Stewart nomination. Mount Sunapee State Park, one of 93 state parks, is known for its unique natural heritage and outdoor recreation. 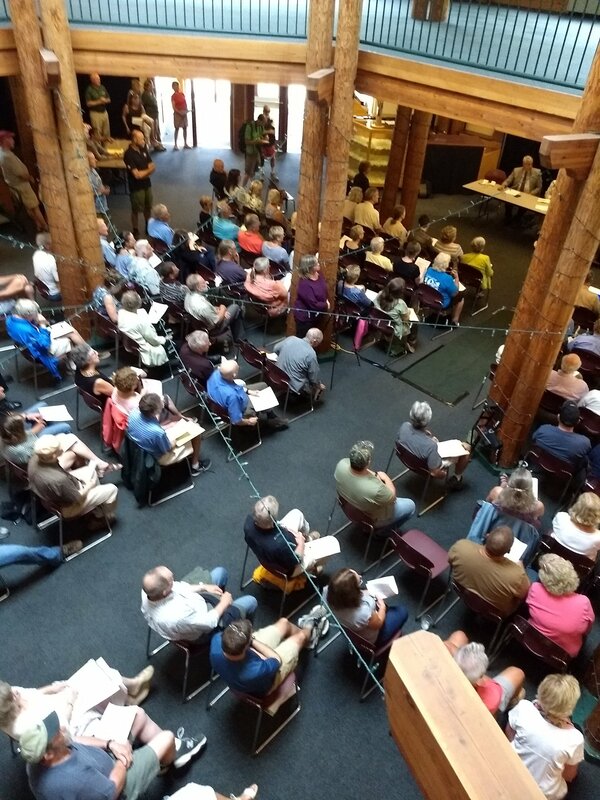 To compel the state of New Hampshire to recognize that its primary responsibility is to serve as guardian of the public interest at Mount Sunapee State Park, and to deny efforts that undermine the essential conservation and public recreational values for which the park exists to provide. To network with individuals and groups across the state that support the wise and thoughtful use of New Hampshire’s public parks and forested lands so as to protect their natural heritage for future generations. “Navigating the weather continues to be an up-and-down elevator ride for area ski resorts, who say sudden warm weather meeting with cold has impacted their visitors — and their budgets,” reports Katy Savage in the Eagle Times (February 26, 2018). “While Presidents Day week is usually one of the busiest weeks for resorts, a 60-degree day at the start took a toll that several say they were unable to recover from,” writes Savage, who spoke to Okemo and Mount Sunapee Resort spokespeople and other ski area operators. This local article comes as we read a new report published by Protect Our Winters, a climate advocacy nonprofit. To share with FOMS your news, information and images, please contact us. “What is being planned for winter and sum mer programs for the ski area at Mount Sunapee State Park? The operator Okemo/Mount Sunapee Resort will discuss its Annual Operating Plan (AOP) 2017-2018 with the state’s Mount Sunapee Advisory Committee on Wed., May 31, 2017, at 9:30 a.m. at the Newbury Town Offices, Route 103. The meeting is open to the public. The resort will discuss operations and projects planned for the coming year, according to the agenda. A hiking trail update is expected, as well. Protection of the public hiking trails at Mount Sunapee State Park, including the woodland Summit Trail, is a priority for FOMS. As of this posting, DRED has not provided FOMS a status report on the Cooperative Maintenance Agreement. FOMS volunteers continue to follow up with DRED, and we’ll post the agreement when made available.